As we promised in our previous article, “Jenkins and Docker Integration for Continuous Delivery” (http://bit.ly/2D71OB2), we will now describe you a cycle of CI/CD using Docker, Jenkins, WordPress (as a to-be-tested platform) and a Test Automation project using the BDD Cucumber framework. As it is mentioned in the previous article, the above integration is going to accelerate and automate the CI/CD processes, resulting in more efficient daily routines. Jenkins, Docker, Cucumber and Pipelines have been described in the first part. Here we will give you a small introduction about WordPress. WordPress (https://wordpress.com/) is a free open-source Content Management System based on PHP and MySQL. It also incorporates additional functionalities like a plugin architecture and a template system. It can be setup as a blog, a forum, an online store etc. We have used WordPress to create a web platform as a demo, so that our Test Automation project can test it. Similar to any dynamic website, WordPress consists of its files that reside on a server (usually in the /var/www/html directory) and its database. We will focus on those two later. At this point we will remind you that we have already created a test project using Java, Maven, Selenium, Junit, Cucumber and Groovy (for the build and test pipelines). The next step is to download all the files of the original WordPress website using FTP, in a zip file. We also need to download a dump of the WordPress database in sql format, this is easily done via phpMyAdmin or via command line. In the previous article we configured a Dockerfile that is used for describing the settings and plugins of the Jenkins container. This time, there is a need of configuring a Docker compose yaml file to bring both, the copy of the WordPress website and the Jenkins instance, live. Docker composer enables us to run multiple services simultaneously and automated, providing efficiency and at the same giving us the ability to include all the configuration steps under one subsistence. 3) create a Jenkins container with the procedure described in our previous post. ,our services (Jenkins, WordPress and Database) are going to be live. We can access them by typing the host IP followed by the corresponding port number in the composer file (yml). For example, WordPress can exist under HOST_IP:6060 while Jenkins in HOST_IP:8090 and so on. As we can see, with just one configuration script and the use of Docker Composer, we created a container with an exact copy of the original WordPress website and a container with a preconfigured Jenkins instance, containing the test project. We can now build it, test the newly created WordPress website and get the test results in Cucumber Reports. Having in our days a vast amount of projects and subprojects running at the same time, we need to use tools to make our processes run faster, automated and easier. 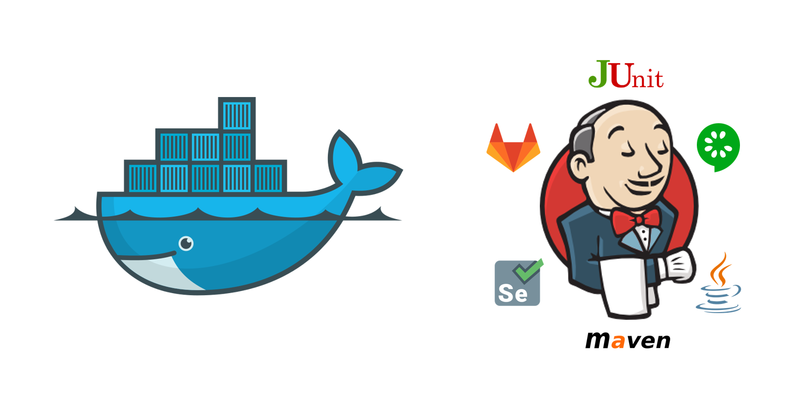 Docker itself is an amazing tool and Jenkins is a state-of-the-art tool for CI/CD. The combination of these tools can provide us the optimum results that we seek for our operations giving us also the opportunity to customize our configuration in multiple ways. For example, we can create and build environments dynamically, with the use of containers and even test them with a dynamically created Jenkins instance. We hope you enjoyed both articles (first part: http://bit.ly/2D71OB2). In case you need to ask something, do not hesitate to contact us, it will be our pleasure to help you.